We often emphasize the importance of safe driving, and for good reason: the average American spends approximately 293 hours in the car each year. But there’s another piece of machinery that many of us operate for several hours each month, and it doesn’t even require an operating license! Can you guess what it might be? If you guessed a lawn mower, you’re correct. The first lawn mower, a non-motorized blade-reel push mower, was invented in 1830 by Edwin Budding near Gloucestershire, England. In 1914, the first gas-powered lawn mower was manufactured in the United States by the Ideal Mower Co. This same company introduced the world’s first self-propelled, riding lawn mower in 1922. Lawn mowers have come a long way in their nearly 200 years of existence, and many homeowners consider owning one a necessity. Today, driving a riding lawn mower looks much less like grueling work and more like simply going for a ride. Unfortunately, it’s a ride that sends more than 80,000 people to the emergency room each year. While a very small number of those injuries lead to death, the most common lawn mower-related injuries include amputation of toes and feet. And the biggest risk is often to children, experts say. Why so? Adults often show less vigilance in keeping children away from lawn mowers than from other dangerous pieces of equipment. The blades on lawn mowers are also usually not visible, so young children may not realize the danger. Furthermore, a riding lawn mower often appears “fun,” like an amusement park ride, and children want to participate. Dress for the job. While you may be tempted to dress as coolly as possible to beat the summer heat, you should always wear protective clothing when you operate a lawn mower or other lawn equipment. Sturdy, closed-toe shoes, long pants, and gloves will provide some protection. Pick up a pair of safety goggles at your local hardware store, too. Clear rocks and other debris from the yard before you mow. Though you can’t see it, the lawn mower’s blade is rotating very quickly – up to 200 mph. Rocks can quickly become dangerous projectiles if you run over them while mowing, injuring yourself or others around you, and damaging your home or vehicle. Never let children ride on the lawn mower with you. While many Arkansans consider this a rite of passage, experts agree that it’s a really bad idea. 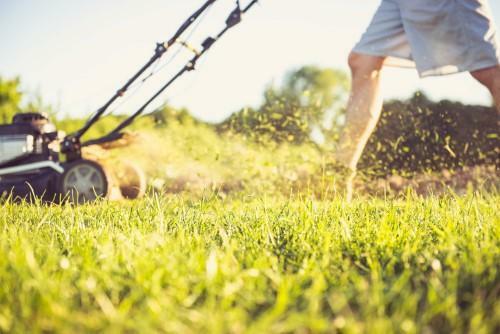 The American Academy of Pediatrics recommends that children should be 12 years old before they begin operating a push mower, and 16 years old before driving a riding mower. Make it clear to your children that mowing is a job, not a game. Better yet, keep all children and pets indoors when you mow to help guarantee their safety – and your peace of mind. Stay parallel. Few of us are fortunate enough to have a completely flat yard, and yet, mowing on slopes can bring added challenges. You may risk having the mower roll back on you if you have a push mower, and if you’re riding, the mower could tip over on a steep angle. To avoid this, be sure to mow side-to-side (parallel) on the slope, rather than up and down it. Much of the time, lawn mower accidents are caused by user error. If you prepare correctly and mow with caution, the majority of injuries can be avoided. But are there ever times when injury is unavoidable? Like all other products, it’s possible for there to be defects in the lawn mower – either with its parts or its production. There have been cases where a mower’s gas tank exploded and severely injured the operator, and where a faulty brake or blade system caused harm to the user through no fault of their own. In cases such as these, you may be entitled to legal compensation for your suffering. If a judge or jury determines that your injuries were caused by a combination of defective products and user negligence, your recovery may be reduced, or they may decline to award damages. If another person’s negligence while operating a lawn mower left you or a loved one with injuries, that person may be held responsible. Contact Taylor King Law today if you have questions or would like to get a free, no-obligation consultation from a qualified personal injury lawyer in Arkansas. Our experienced team of attorneys and support staff are always ready to be On Your Side, By Your Side. Get started by calling 1-800-CAR-WRECK (1-800-227-9732) or completing the form on our website.